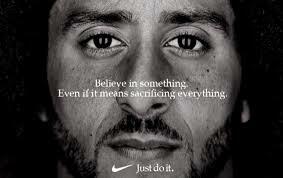 On Tuesday, Nike announced their ad for the 30th-anniversary of their slogan “Just Do It”, which featured Colin Kaepernick, the former San Francisco’s 49ers quarterback who has made himself into an American hero by kneeling for the national anthem when it was played before football games started, protesting the racial injustice of police officers purposely shooting innocent black people. The ad was a close-up of Kaepernick’s face and had the phrase, “Believe in something. Even if it means sacrificing everything” in the picture as well. Even though Kaepernick was benched because of his low quarterback rating, which was in the bottom one-third of all starting quarterbacks according to ESPN, before he even started kneeling or sitting for the national anthem, and decided to opt out of his contract with the San Fransisco 49ers and even turned down a contract offer from the Denver Broncos after leaving San Fransisco, his bravery is impeccable. So much so that President Trump shouldn’t hesitate in the least to award him with a Medal of Honor, an award normally only given to members of the military who go out and risk their lives for the safety and freedom of our country every day. Kaepernick has sacrificed so much even though he has still earned millions of dollars by not playing in the NFL. All of this has made conservatives very angry, saying that Kaepernick isn’t a real hero and is a disgrace to America and it’s service men and women by not standing for the flag. Many veterans themselves have come out in support of Kaepernick and say that they don’t have a problem and actually support what he is doing, even though there are also veterans on the other side who feel disrespected by Kaepernick’s actions, but we won’t talk about that because what do they know? They probably voted for Trump to be president so that really shows how much their opinion matters on anything. Conservatives have also pointed out that Nike exploits child labor in order to make their products for cheap in foreign countries, which totally contradicts Kaepernick’s stance. But as usual, they have no real proof of this so we’re just going to pretend this doesn’t actually happen. All of this goes to say that Colin Kaepernick is the true, ultimate American hero, regardless if you see it or not. He should be what every American strives to be. He has given up so much and made things very hard for himself, but that hasn’t changed his view that police officers are intentionally shooting innocent black people. He’s continued to be a solid rock despite conservatives constantly ripping on him for his behavior, and I can only pray that we have more people like him come along and make a difference like he has.